I have to confess, these past few days I’ve felt pretty uninspired with cooking. You would think that’d be impossible considering how much of my time is spent thinking about and even dreaming about food, but it happens. 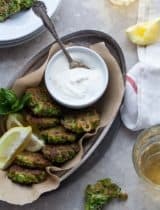 Oh, there are artichokes and asparagus and all manner of tempting produce in season at the moment, but sometimes the truth of the matter is there are many days when the last thing I want to do is cook. So this is the general course of events on those days: my stomach rumbles, I go to fridge, open the door, and sigh. A few bites of leftovers here and there, a couple slivers of cheese, a few nuts, maybe a few berries if I’ve got some and I call it a meal. Oh, and this dip. This is my go-to dip. Smooth and creamy, this is the sort of thing I could sit down and make a meal of. I have a thing for feta. I’ll put it on any and everything, it’s salty and creamy and just so good. The tangy, salty flavor of this whipped feta dip is like a taste of the Mediterranean. 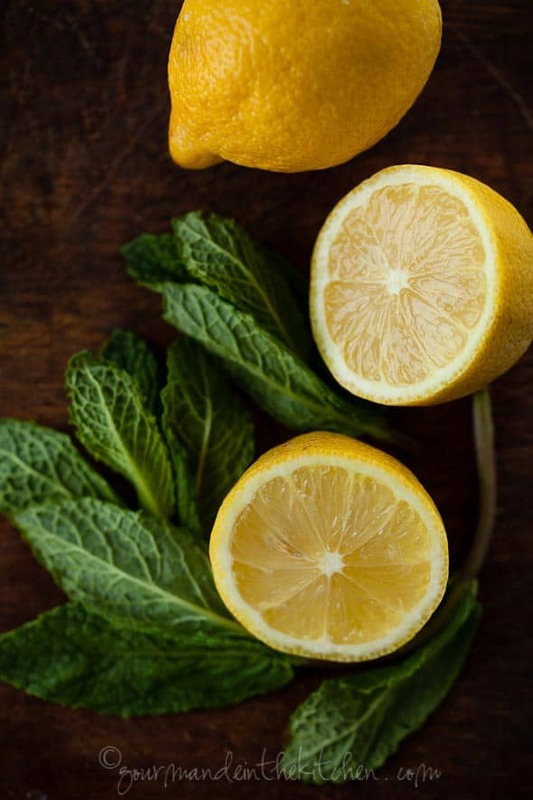 Its origins are Greek inspired with a bright kick of lemon, that I finish with a fresh mint and parsley pesto. Incredibly smooth and airy, it’s a good starting point for a dinner party or even an entire meal. Serve it with pita bread or with almond crackers (as I did) and a side of cucumbers lightly dressed in lemon juice and olive oil. 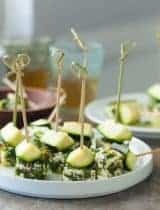 For a one bowl meal, pile crackers into bowl, scrape mint pesto feta dip onto said crackers and spoon cucumbers on top. Grab a spoon, fork, or just your fingers and dig in. The tangy, salty flavor of this whipped feta dip is like a taste of the Mediterranean. Rinse and gently pat dry the feta and place it in the bowl of a food processor. Pulse together with half of the lemon juice and the Greek yogurt until smooth and creamy. Remove and refrigerate for at least 1 hour. Clean out your bowl and place the garlic, mint, half of the un-chopped parsley and a pinch of salt and pepper inside. Pulse until finely chopped. Turn food processor to “on” and stream in olive oil until a pesto-like consistency is achieved. Remove and set aside. Combine the remaining lemon juice, olive oil and the ¼ cup of finely chopped parsley with a pinch of salt and pepper to the chopped cucumbers. Mix to combine and place in serving bowl. 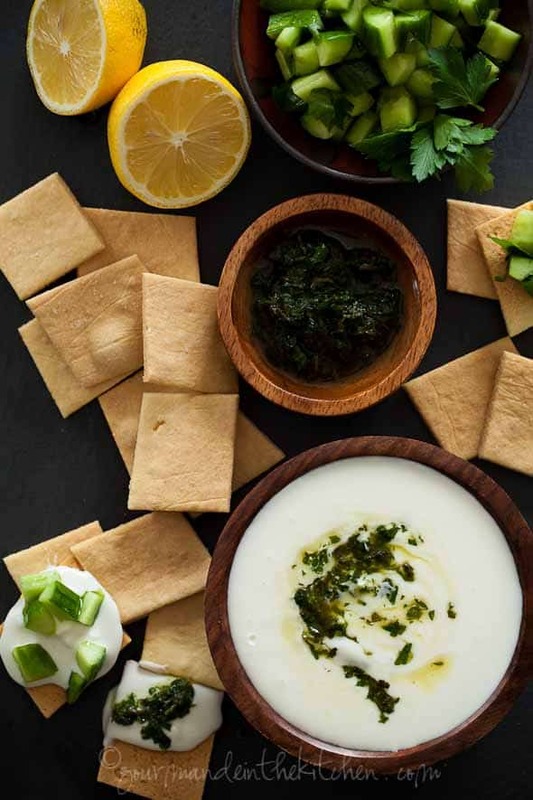 Just before serving, place the feta dip in a shallow serving bowl and top with the mint, parsley pesto and an extra drizzle of olive oil if desired. What’s your go-to meal when you don’t feel like cooking? Love that it's whipped..I bet this is so creamy and heavenly! I've been feeling the same way lately, busy and pretty uninspired, but you're doing a great job though... that creamy feta dip looks delicious and elegant at the same time, I like it! I also have a huge thing for feta as do my men and this dip would disappear in a flash! And a great way to get even those who avoid vegetables to eat them! I've been off cooking, too lately. Maybe because we are in between season and I am desperately waiting for the artichokes, asparagus and summer fruits to show up at the market! Just lovely! Looks so fresh and perfect for spring. The little swirl of pesto in the whipped feta is gorgeous. I do have some solitary meals in the afternoon, so a big spread is really not the thing. My lunches are somewhat like your meals of a little of this and that. Your dip would be the perfect thing to take center stage at lunch with a few crackers or veggies-yum! Love the flavors here. Well done. That happens to me so often. I'm a grazer too. And if this is in the repertoire, I can totally go with it. Feta is a fave of mine as well and I'm loving this whipped dip! I would not have guessed that feta could become so creamy and light! I just know I would love this dip. Lovely post, Sylvie. 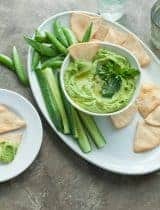 I love everything about this dip - I see it making a regular rotation in my summer appetizers, or spooning some over a chicken souvlaki salad for a delicious dressing. I hear you, I've had many bowls of granola for dinner! Thaaaaat looks insanely good. My eyes can't even take it. What a fabulous snack! You may have beat my sweet potato fries. This looks magnificent! How about your fries and my feta dip together?! Now we're talking. Sylvie, this looks like EXACTLY what I need right now for an afternoon snack. oh I can name a number of things to eat and use this with! Its so refreshing and clean and beautiful and yummy! I'm with you on cooking -- there are days when I just don't feel like whipping a whole meal. Grazing is the way to go. 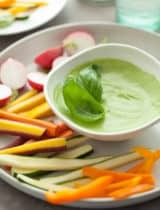 Love this dip paired deliciously with mint parsley pesto and cucumber salad. So refreshing & light! I too love, love whipped feta! Incredible flavours, isn't it? I'm pretty sure I've never seen feta look anywhere near this creamy and delicious! I grew up eating tapas meals, especially with feta dips. It's my favorite way to eat, though we call it meze. I'm loving this whipped feta with pesto - I'm in love! I put feta on everything too. It's saltiness compliments so many things perfectly. When I'm really not in the mood to cook I make a quinoa salad with whatever fruit I've got and feta. It's super easy and somehow wakes up my taste buds. I can't wait to try your dip recipe! All of those colors together, Sylvie is so warm and inviting. The combo of the feta (salty) and the cucumber (crisp/sweet) is mouthwatering. P.S. grazing is my middle name! I love to cook but I so know the way you are/were feeling. Sometimes I just want easy and good and you have hit the nail on the head with this one Sylvie. Umm umm good. Yes, I know this feeling too. Strangely the appetite is always here, but the inspiration is not au rendez-vous... Well, then it depends if I'm on my own or not. I'll just snack on bread and what I can get from the fridge to make savory tartines. I think everyone has that feeling once in a while, when you get home from work and cooking just feels like a complete chore. 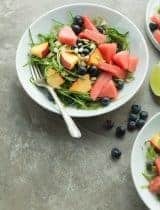 If I'm in that mood, some sort of simple salad thrown together usually works for me (or a bowl of homemade ice cream!). This dip looks lovely - salty cheese and fresh vegetables is such a winning combination. I prefer to snack in the afternoon than have a big dinner. Well cooking inspiration has waned for you but photography hasn't! I simply can't imagine a dip that would be more welcomed in our home than this one! Truly all our favourite flavours, and with a surprising texture, too. Just lovely! Oh my heavens does this sound decadently delicious!! I share the same love for feta cheese and this looks incredible! Right when I thought I used feta on everything, I see this must try recipe, yum! I love your new look too, Sylvie!! I've been so busy with my new job that I haven't been visiting my favorite sites for awhile! It's just lovely! What a delicious idea for a dip! This looks fabulous, Sylvie. I love your flavor combinations, as well. Great recipe! Hi Sylvie, first, we all get tired sometimes, so making a small break is in fact a good thing to do. :) I agree with you completely because I am a feta fan too. I think I never make salad without it. This dip is really something I must say. Have a nice day and thanks for sharing this amazing idea. Grazing = perfection. One of my favorite ways to eat because you get to munch on all manner of food without judgment. I love feta for the same reasons you cited. I usually crumble it up lazily with my hands, lick the salty remains from my fingers and call it a day. But this creamy whipped texture with some pesto stirred in? Amazing! I totally agree with you. I don't feel inspired to make anything lately (part of the reason is the kitchen situation). But you still look like a winner to me with your gorgeous pictures and refreshing pesto. count me in as uninspired lately too!.......but I sure could go for a bowl of that dip!! just gorgeous Sylvie! Hi Sylvie! My husband and I are throwing ourselves a belated wedding reception in NINE DAYS (we eloped almost two years ago), and I'm scrambling to come up with a few non-meat edibles for about 140 guests. Do you think the dip will keep until Saturday if I made it on a Thursday? I'm thinking it might even go well with sliced cucumbers, some pita chips, and cherry tomatoes. (I need a simple platter I can just put out.) Thanks! [K] P.S. Gorgeous, by the way. First of all congratulations on your belated celebration! Second, to answer your question, yes absolutely. I would make all the parts separately and they would be fine for a few days in the fridge. So if you make it, keep the dip separate from the pesto and the cucumbers until right before you serve it. The cucumbers will release some water if you dress them with the vinaigrette so you may want to dress them at the last minute as well. I'd recommend serving this with the pita chips and veggies like you said. I've had it with blanched asparagus and it was delicious, crunchy celery would be nice too! Good luck and enjoy your reception! 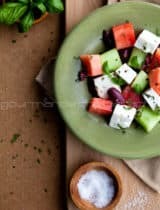 I have a thing for dips..I have been eating hummus with cucumbers like there is no tomorrow.. (I'm dieting)I think I need a change and will try your recipe for this creamy whipped feta...looks refreshing! I MUST try this! Sounds fantastic!! oh yeah! I too have those days .. mostly on Friday nights and then it at times drags until weekend gets over :D The dipping sounds sounds flavorful and delicious! 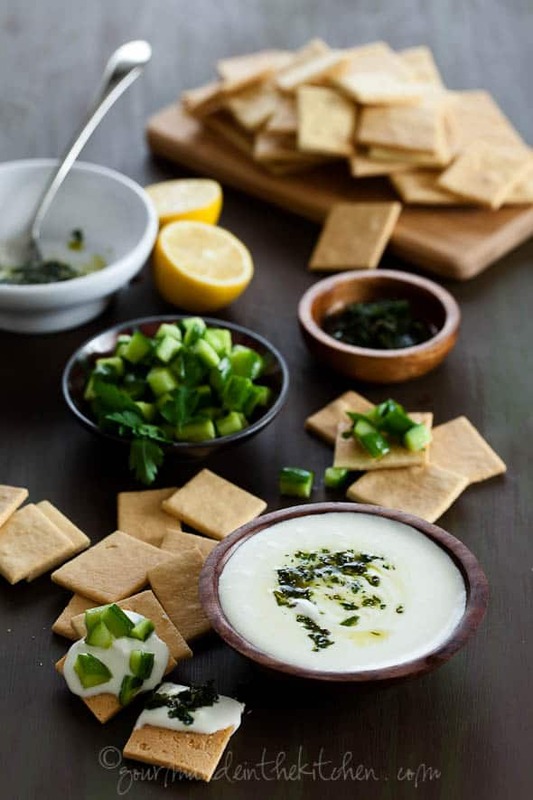 Sylvie, love the idea of whipping feta into a creamy dip. We all have our days when we don't feel like cooking. Unfortunately, for me, I can't really get away with it as I have five mouths to feed. Oh, yum, this looks so good! My husband doesn't like dips (I know... I can't understand it!) so if I make this, for sure I'll be eating the entire dish by myself! Which looks like it wouldn't be a problem! Sometimes it is hard to find inspiration to cook...but this dip would make up for it in a heartbeat! Looks and sounds like creamy perfection! Looks amazingly tasty...perfect snack for watching a movie....bet a could devour a bucket of this! MMM,...what a great & tasty dip! I love this! Yum Yum Yum! That special pesto looks equally tasty! I am always looking for new and unique dips and I am loving everything about this. Yum! Oh, how heavenly! I also have a thing for feta - there s hardly a dish that cannot be improved by its addition (OK, maybe not a banoffee pie!!). This dip contains all my favourite fresh spring flavours - I love it. I too, put feta in everything I can possibly think it might be good in (and usually it is!). this sounds like a lovely light dip - I'll be giving it a try. Love the new look of the blog too! Very clean and simple! I love cheese and feta is up there with my go-to favorites. This dip looks very delicious. Love the new blog look, too. Having a dinner party soon and this is exactly what I've been looking for, so fresh! By the way, did you buy the crackers or make them? I am gluten free. 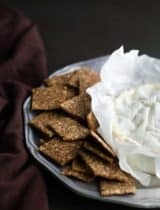 I made almond flour crackers to go with the dip in the pictures but I've also got a recipe for flax crackers that are gluten-free you might like. Thank you, they sound easy enough! This is right up my alley - and I agree, I could definitely make a meal out this dip. Can't wait to give this one a try. Gorgeous recipe. So good for summer here! Its refreshing!! Hi Sylvie! Being sick and the fact that I came back from vacation, I'm a little uninspired and lost interest in cooking & photo shooting. It suddenly looks a lot of work... I look at your beautiful pictures and now I'm a lot more inspired than before. 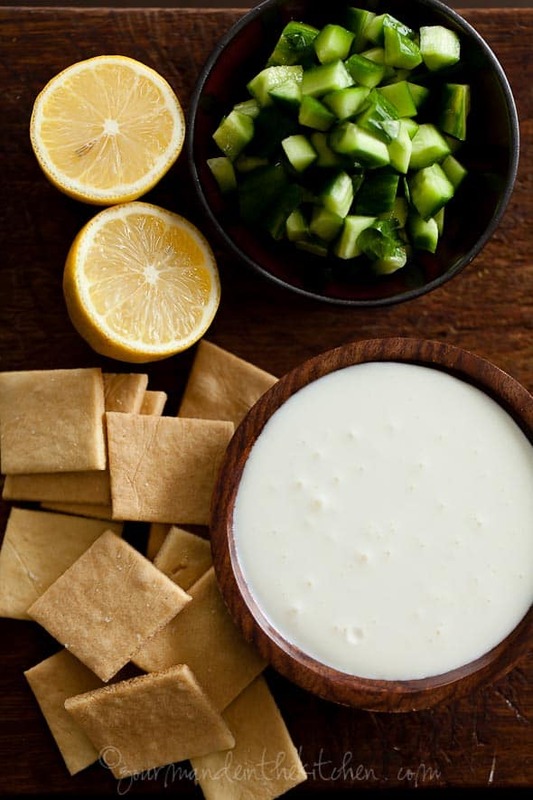 Love this dip - I can tell how delicious it is through your photography! This looks lovely – I’ve never made pesto with parsley. I’ve recently fallen in love with quinoa pasta. It’s slightly nuttier in taste than wheat pasta. Might work really well with this sort of pesto, especially with the pistachios… awesome photography as well! Thanks for your writing, I enjoy your recipes very much. 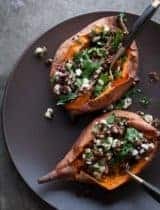 Noting your fondness for feta, herbs, nuts, and berries in savory dishes, it's likely you'll enjoy Persian dishes as these are the hallmarks of the cuisine. I can recommend my two favorite blogs for this: Fig & Quince, and Tumeric & Saffron - both are good places to start if you're interested to try it out. With warm wishes for a delicious & healthful 2014!